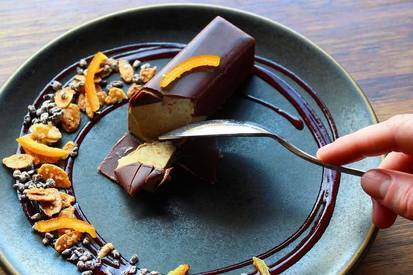 A dreamy, chocolate-dipped dessert from a James Beard Award-winning pastry chef. Though the recipe is spread out over a few days, each step is surprisingly easy, making this the ideal make-ahead dessert to have ready in case last-minute guests—or late-night sugar cravings—come knocking at your door. We prefer using tempered chocolate in this recipe as is encourages the creaminess with the custard! Besides, we temper chocolate for everything!